Finally! It’s officially fall, and Virtue Cider will be hosting its inaugural Virtue Cider Apple Fest—four days of cider-filled festivities—from Thursday, September 29, through Sunday, October 2, at Virtue Farm in Fennville, Michigan. Thursday, September 29, 5–8 p.m. The Thursday Night Market is the Apple Fest kick-off. From 5–8 p.m. the weekly market features fall items from area makers and local farms. This is the official release for Percheron. There will also be live music and food available for all. Friday, September 30, 7 p.m.
Barbecue Night! Starting at 7 p.m., come by the farm for locally created barbecue from the culinary team and live music on the lawn from Bone Jugs. Saturday, October 1, noon–7 p.m. Celebrate the first day of October on the farm with a day of family-friendly fun! Traditional Percheron draft horses will be on-site for horse-drawn cart rides. Outdoor games and activities for kids will be going all day long. Need a ride? Virtue Cider is hosting a single round-trip shuttle from Chicago to Fennville on October 1 only. Click here to learn more! Sunday, October 2, 2 p.m.
Sunday Funday takes the form of a gravel fondo in Allegan County. Velo City is organizing a long-distance ride in two lengths leaving from Virtue Farm at 2 p.m. Click here for tickets and more information. Even if you’re not biking, join Virtue in the afternoon for food and live music on the lawn. 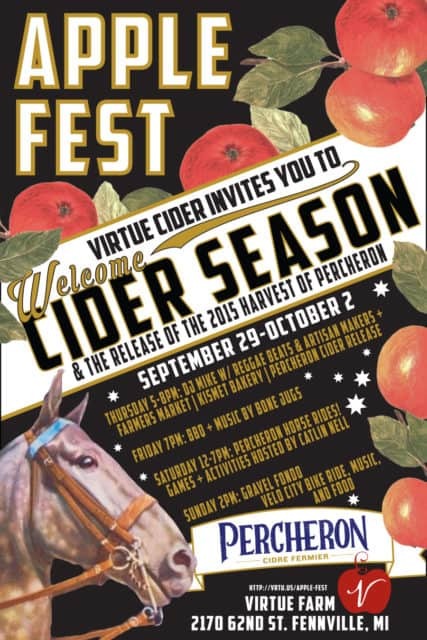 Virtue Cider is located at 2170 62nd St. (122nd Ave.) in Fennville, MI; phone: (269) 650-0668.